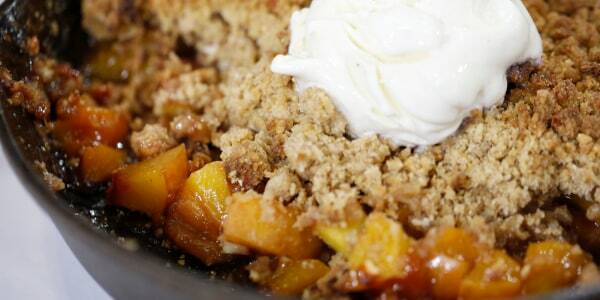 You can use any sweet, summer fruit for wonderfully nutty crisp, which is easily baked in a skillet. Or use some combination of blueberries, raspberries, apricots, cherries, plums and strawberries, as long as the fruit is ripe and juicy. This dessert is best baked within a few hours of serving. But don’t serve it hot from the oven. The juices need to cool to room temperature to thicken properly. Tip: You can also swap out any kind of nut for the almonds. Or just leave them out entirely for a nut-free version.